Can't say that I'm happy it's Monday morning, but I don't really have much choice in the matter. I didn't sleep particularly well due to my allergies last night, so today is going to be long. I might need caffeination to assist me around lunch time. I'm happy to report that I survived my weekend of class though, and my case study briefing went very well. Next up on my task list is finalizing my poster for ILA. ....the Drakensberg Mountains in Mpumalanga, South Africa. 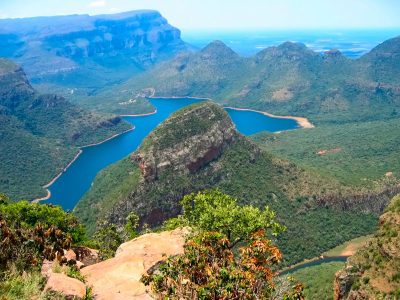 This location is believed to be the inspiration behind the setting of the Lord of the Rings, and the view from Blyde River Canyon is referred to as God's Window. Hiking and horseback riding are preferred, but you can even take a helicopter over. 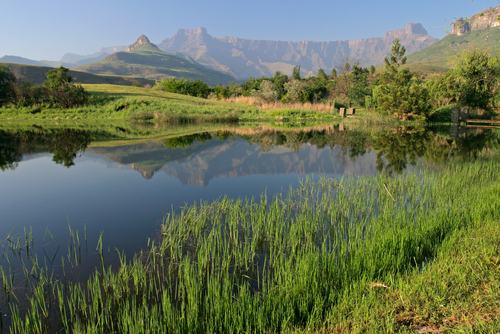 And if you're lucky, you might be able to even find a waterfall or two at this Wolrd Heritage site. Pretty, but such tiny pictures! Is your blogging software shrinking them down to the size of your left-hand column? I'd like a "click to see full size" option. No, not the software - just pics that I've been able to find online and those are the sizes. If you look at the pics from my trips though, they do get much bigger when clicked.